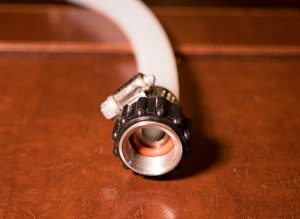 This week we take a look at the most common connectors used for home brewing systems on pumps, kettles, and fermenters. 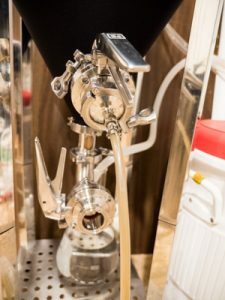 I compare Tri-clover, Camlock, Blichmann NPT and Quick Connect options for your brewing systems. We look at the advantages and disadvantages of each. Lets start by saying that the vast majority of brewing equipment uses a threaded 1/2″ NPT connector. This includes most brewing pumps, most ball and butterfly valves and also most homebrew size brew pots. This connection, slightly smaller in diameter than your average garden hose, works the same way – you screw some kind of connector or hose on it just as you would your garden hose. 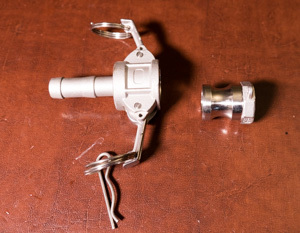 The NPT connector is not inherently sanitary, so you do need to remove, clean and sanitize it if it is used on the “cold” side for brewing. Hot side connections such as boil pots and most pumps are less of an issue, though you still should do some periodic cleaning as the NPT connectors can still collect some dirt and mold. To connect homebrew componets together the standard is 1/2″ silicone tubing. This tubing is highly temperature resistant, flexible and easy to clean. It also gives a good flow rate – up to 8 gallons/min (24 l/min) with a good quality wort pump. Since the NPT connector and silicone tube is the standard, in most cases we are adding Tri-Clover, Camlock or quick connect adapters to fit either the NPT connector or tubing. I’ll start with the Blichmann Quick Connect since its the simplest to explain. It is a stainless 1/2″ NPT female adapter with a plastic sleeve, usually with a 1/2″ barb connector on the other side that inserts into the 1/2″ silicone tubing. It also has a small rubber O-ring that seals the connection. The connector is simply screwed onto the male NPT fitting on your kettle or pump, much like you would a garden hose. Despite the fact that the connector is not that “quick” since you have to screw it in place every time, it does have some advantages. First I really like the plastic sleeve that lets you connect it without gloves even when the fitting is hot. Most of the other fittings on something like a boil kettle can get really hot and burn you if you don’t wear gloves when changing them out. Second, the gasket seals well with minimal effort, so you can connect and disconnect without much risk of a leak. Finally, when you remove the NPT connector, you effectively expose the threads to cleaning, so you don’t necessarily need to do a separate cleaning of these parts – just remove the hoses and clean as you normally would. These are the connectors that came with my BrewEasy system and I still use them as this particular system does not require many tube changes during brewing. Camlocks are used in many industrial applications and consist of a male and female connector with a seal, and are available in stainless steel. The female connector has two levers on it which you pull back or forward to seal or release. The levers lock the male end in place so it won’t come loose. For home brewing applications, I purchased a set of male conectors with 1/2″ NPT sockets I could attach to my pump and kettles, and a set of female to 1/2″ barb connectors to use with the 1/2″ tubing. The advantage of Camlocks is they are very quick to connect and disconnect and the locking mechanism provides a solid water-tight seal. They are much faster to connect than screw-on NPT connectors. The disadvantage is that they do get hot on locations like the brew kettle, so you do need to wear gloves when handling hot connections. Also because one end has an NPT screw adapter on it, you still need to occasionally clean that threaded NPT adapter out as its not sanitary. Tri-Clover fittings are sanitary and are widely used in commercial brewing applications as well as many food/beverage applications. The connection consists of two tri-clover connectors, a separate silicone seal, and a tri-clamp that holds the three pieces together. They are available on some stainless homebrew fermenters where sanitation is important as well as commercial level brewing equipment. The problem with Tri-clover fittings is that they are really only sanitary if they are welded in place. I mentioned that a typical homebrew kettle, valve or pump has an NPT connector, so if you add an NPT to tri-clover adapter you really don’t have a sanitary connection anymore. 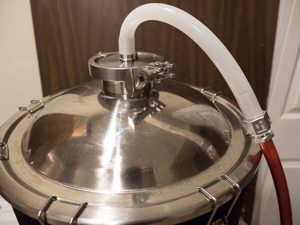 You can purchase kettles, pumps and fermenters that have welded Tri-clover connections on them, but they typically are much more expensive. Another problem with tri-clover fittings is that they are anything but “quick”. 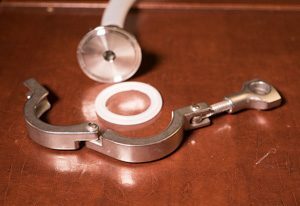 To connect two fittings, you need to hold both fittings in place along with the silicone seal while wrapping the clamp around it at the same time. Two hands will get the job done eventually, but its best if you have three hands to hold it all in place while you connect things up. Like Camlocks, they also absorb heat, so a tri-clover kettle is going to get pretty hot and likely require that you have gloves to reconnect it. Finally tri-clover fittings are generally more expensive than other alternatives. Since each connection requires four pieces (two connectors, a gasket, and a clamp) they are not as cheap as NPT or Camlock connects. In my opinion they are best used on the “cold” side of brewing – for example welded onto a stainless fermenter where sanitation is important and you don’t have a lot of hose changes to make. In addition to the options above many homebrew stores sell “other” quick connects that are not camlocks, and are actually made for applications like air hoses. These typically have a male and female end like the camlock, but don’t have locking arms and instead have a ring you push to release/lock the two ends. These connectors have the same advantages/disadvantages of camlocks, including a typical NPT adapter connection, heating up of the connector and quick-connect ease of use. I personally prefer the camlock for the positive locking mechanism, but these in practice are very similar to a camlock. Not surprisingly, picking the right connectors for your brewing system is highly dependent on your system itself. 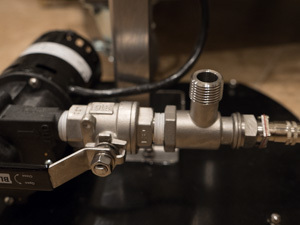 For example on my Blichmann BrewEasy, I actually only have to change one hot-side connector when brewing – moving the pump output from the mash tun to my plate chiller during the boil. Since I have 60-90 minutes during the boil to set up my chiller, having a quick connect is not a huge deal for me, so I use the Blichmann connectors for the hot side of my system so I can handle them without gloves. If you have a three tier brewing system with two pumps where you may actually make and break several connections while brewing, it may be more important to have quick connects like the Camlock installed so you can change things over quickly. It may also be perfectly appropriate to mix connectors. For example I have a SS Brewtech fermenter which has tri-clover fittings on it. So I have one special hose that connects from my Therminator plate chiller (an NPT fitting) to a Tri-clover fitting so I can chill and fill the fermenter from the bottom. I have another special tube with a tri-clover on one end and keg connector on the other end that I use to pressure-transfer beer from my fermenter to fill a keg. Whatever you choose, pick something that is easy to clean and works for your system! Thanks for joining me on the BeerSmith Home Brewing Blog. Be sure to sign up for my newsletter or my podcast (also on itunes…and youtube…and streaming radio station) for more great tips on homebrewing. I have been using CPC plastic fittings since I upgraded to an all pump system. These fitting work well for me because they conduct no heat and are very heat tolerant. These fitting are about 8 years old now with no signs of wear or any breakage. One thing though, they are very tough to find in brew stores anymore they have discontinued them mostly for camlock style, i go directly to the CPC website, purchase extra orings, this is the part that sees the most abuse, I purchase my orings through McMaster Carr and it’s a silicone oring. Petrol Gel is a very good food based lubricant to help extend oring life also. Hope this helps anyone with fitting questions. Prost!! i get your information by google search . we are a manufacture &exporter of stainless steel screwed fittings and valves, they are made from precision castings, our products are weidely used in industrial ,chemical, food industry and water treament fields. Our products are good quality&competitive price , most of them exported to Europe ,America . we have done this business for more than 16 years . we have rich experince . if you are interested in our products, feel free to contact with me . sincerely looking forward to cooperation with you .